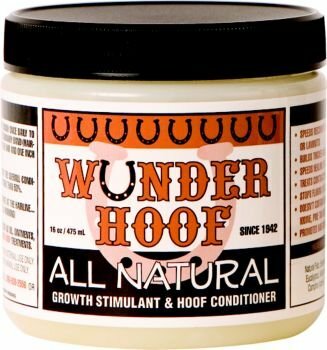 Wunder Hoof – all-natural growth stimulant and hoof conditioner helps maintain healthy hooves. Increases blood flow without blistering, helping accelerate hoof growth. The pain-relieving and antibacterial properties of Wonder Hoof help improve condition and soundness, and promote healing of the hoof. Creates a breathable barrier while maintaining natural moisture balance. Not just for hooves! WunderHoof also aids in the treatment of scars, saddle sores, scrapes, scabs, small cuts, and arthritic, sore joints. Quickly and easily absorbed into the skin. WonderHoof improves hair growth and repels insects from treatment area. Solution contains essential oils, including kokum butter, camphor and eucalyptus. Free of irritating ingredients; will not cause blistering. Apply by hand or with hoof brush 1" above and below coronary band, completely around the hoof. Treatment - use daily until desired results are achieved; Prevention - use 2-3 times per week. 16 oz = 2-3 month supply per horse. 30 day satisfaction guarantee. Discover why veterinarians, master farriers, owners, trainers and thoroughbred farms love Wunder Hoof!